Visit our Welding Facebook page for more info! 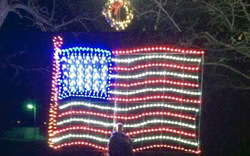 GRTS welding students contribute each year to "Festival of Lights"
at Simpson Park in Chillicothe. Here is their newest project for 2015! Our program is an institutional member of the nationally-recognized American Welding Society (AWS). Instructor is an AWS Certified Welding Inspector (CWI). Looking for a career in an ever-growing field? Industrial Welding may be what you are looking for! Welding plays an important role in the expansion and production of our industries. Graduates of this program will be ready for the challenge of this ceaselessly growing field. Is Industrial Welding the Career for Me? The Industrial Welding program at GRTS prepares students for high-demand careers in the welding industry. Many of the products we use each day are manufactured using different welding processes. The use of these products grows daily, thus increasing the number of jobs for people with welding skills. The need to fill these jobs is not concentrated in major metropolitan areas, but is found throughout the country and the world. Post-secondary students need to have a high school diploma or equivalent. Our tuition fees are based on the cost of operation of the program and are set in July of each school yar. A $50 enrollment fee is due at the time of enrollment and is credited to the first semester tuition. High school students attend for three hours per day over a 2-year period. Post-secondary students attend classes for six hours per day for nine months, giving them a total of 1,080 hours of instruction. Students who successfully complete the program will receive both a certificate of completion and 30 articulated college credit hours with North Central Missouri College in Trenton. Maintaining excellent grades and attendance can give students the opportunity to join the Ironworkers Apprenticeship program where the student earns over $16.78 per hour while receiving advanced training in the welding field.